The Empowering Women in Business Conference is hosted by the Institute for Women’s Leadership at Nichols College. It is designed to provide the support, motivation and resources needed for businesswomen to be successful and inspire the leaders of tomorrow. This conference will provide women with the dynamic opportunity to advance their career, grow their business, or help map their future by pursuing professional development within a welcoming environment of career-focused women leaders. Women can expect to gain a newfound inspiration, a sense of achievement and an increased business network within the local community. 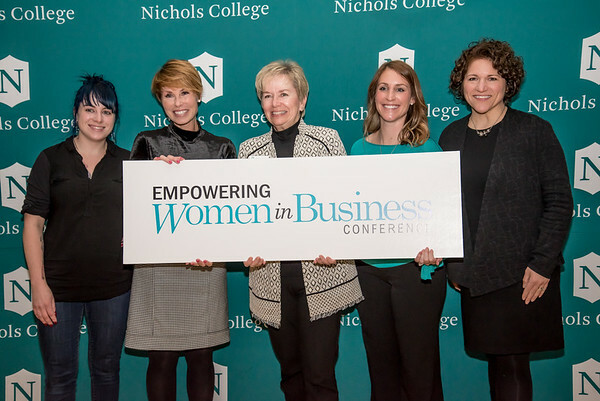 The Empowering Women in Business Conference focuses on offering a diverse collection of sessions and networking opportunities designed by business leaders, educators, and Nichols students to provide attendees the opportunity for enhanced business skills and individual growth. The community audience will consist of businesswomen from the local area and Nichols College Day students, Graduate & Professional Studies students, alumni, faculty, and staff. The conference will provide a dynamic learning opportunity. Attendees will be encouraged and offered the opportunity to network within the community. The conference will be offered at a reasonable cost to encourage a continuous learning environment. The conference will offer a venue for committee members and the Nichols community to mentor students who volunteer and participate with the conference.